Now that we have your attention, let’s pause and think about holiday desserts. Close your eyes and anticipate the sights, the sounds, and the aromas of the winter holiday season. How far did you get before food entered the scene? Were you baking sugar cookies with the kids, or serving cranberry bars to the carolers? Did you attend a community potluck, with its high dessert ratio, or an open house rich with the aroma of gingerbread? There’s good reason we center much of our celebrating around food—especially lavish, almost sinfully indulgent desserts. Holiday baking warms our hearts along with our kitchens, heightens our senses, and encourages the spirit of sharing and celebration. It’s a perfect opportunity to express the festive extravagance that marks the season. And oh my…here’s a little extravagance now. As if chocolate, rum and heavy cream aren’t enough, we’ve added some coconut to put these over the top, decadence-wise. These truffles can be packed in a beautiful tin as a gift to someone you love that much! Hello, adult dessert. In a small, heavy saucepan (or double boiler), melt butter and chocolate together until smooth. Remove from heat. Add rum, cream, egg yolk, sugar, almond extract, and 1/2 cup of the coconut. Whisk until well blended. Cover and refrigerate for at least 4 hours. 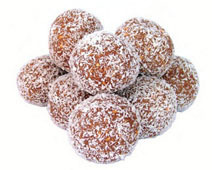 Roll into one-inch balls, then roll the balls in the remaining 1 cup coconut. Set on waxed paper to harden. Store, covered, in the refrigerator for up to 2 days, or in the freezer for up to one month. Please let us know what treats you like to bake and give for the holidays! This entry was posted in In the kitchen and tagged coconut rum truffles, food, Frontier, holiday desserts, recipes, truffles by Cayenne Room. Bookmark the permalink. These look fantastic, these would make great gifts for friends and family.. Thanks, Brian! Let us know if you try them! Yum, and then there is the rest of the bottle of dark rum. These are now on my ‘to bake’ list for this weekend! Hello there! Thiis articke could not bbe written much better! conmstantly kept talking about this. I most certainly will send this post to him.